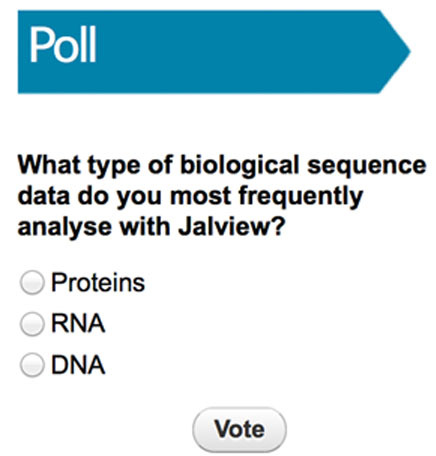 Jalview website has a NEW poll! Biologists had the highest vote (55%) and bioinformaticians were second (33%); we were pleased that chemists (5%), software developers (4%) and clinical researchers (3%) also voted. Anyone can vote and view the results (one ip address/one vote). "Jalview Version 2 - a multiple sequence alignment editor and analysis workbench"